I hadn’t blogged for a couple weeks because I’ve been traveling. First, I went to California to visit a few friends and meet up with my parents at the San Francisco International Airport. From there I acted as their tour guide, taking them to Lisbon, Seville, Granada, Madrid, and Barcelona. My folks then flew up to Scandinavia while I remained in Spain, mainly to hike the Camino de Santiago from Irún to Santiago de Compostella. The distance is more than 500 miles, which I hope to complete in 19 days and catch up to my friend Tori—who is hiking the last 72 miles of the Camino—on October 11 or 12 so we can finish the Camino together. The route I’m hiking is the Camino del Norte along the northern coast to Spain for the first 300 miles. Then I will walk towards and through Oviedo, after which I will hike the Camino Primitivo. The latter is the original route pilgrims walked to Santiago 1000 years ago. Both the del Norte and Primitivo routes are exceedingly hilly, and considering the distance I have to hike each day, it is imperative that I travel as light as possible. 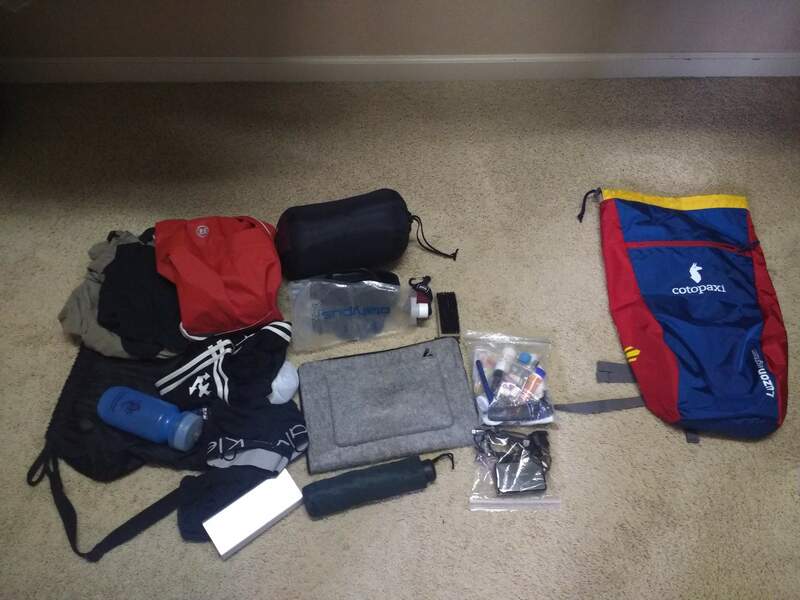 I usually travel light anyhow—e.g., during my frequent flights to St. Louis, I bring only a laptop bag which avoids Frontier Airlines’ carry-on and check-in baggage fees—but I don’t think I’ve ever carried so little for a multi-week trip except for the self-supported Tour Divide and Trans Am Bike Race bikepacking races. Two weeks into the trip, I hadn’t wished I had brought something that I left at home, or wished that I didn’t bring something I brought. The packing list above had been just about right. But after starting hiking across Spain on the Camino de Santiago, I wish I had packed even less. For starters, I would not have brought my Surface Pro 4 computer, as I was not using it nearly as much as I expected and could have gotten by with just a smartphone. 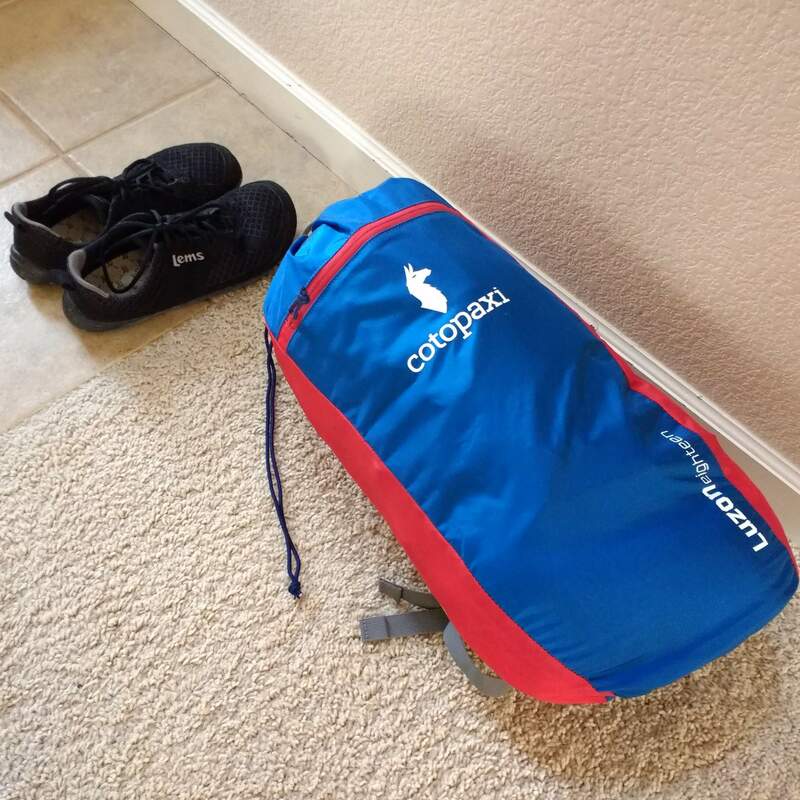 I also would have left the sleeping bag at home and instead brought an emergency bivy sack (glorified trash bag) that packs smaller than the size of a fist. In the future, I can see myself packing lighter still. E.g., if I had jeans that fit better, I could forego bringing a belt. When I eventually replace my Surface and Moto G4 with devices with USB-C, I can bring less chargers and only one power supply. October 19, 2017: My flight from Barcelona back to the U.S. involved multiple legs as part of an ultra-low cost ($360) “hacker fare.” This included flights on Frontier, which typically has super low base fares but charge for everything including a carry-on bag. 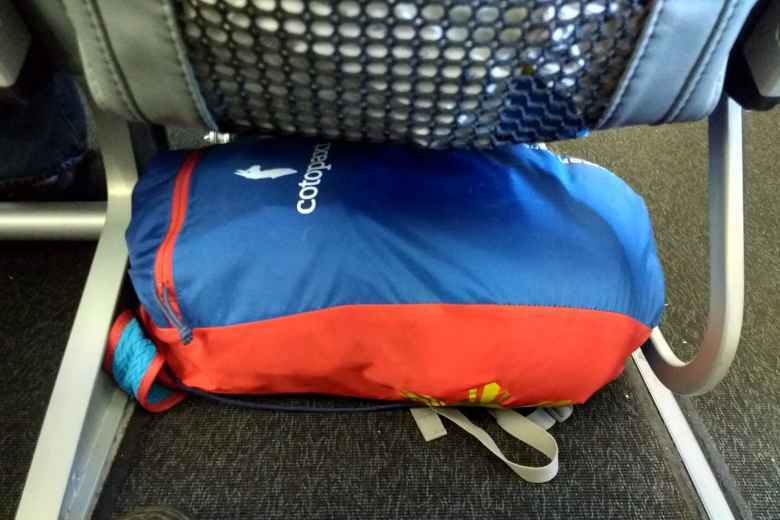 But my Cotopaxi Luzon 18L bag with all the gear above ended up being small enough to fit underneath an airplane seat and therefore count as a no-charge personal item. Amazing!